The women’s cross county team concluded their season with two Crossroads League All-Conference honorees at the conference meet at Indiana Wesleyan University. Sophomore Aspen Dirr also qualified for the NAIA National meet for her second straight appearance. 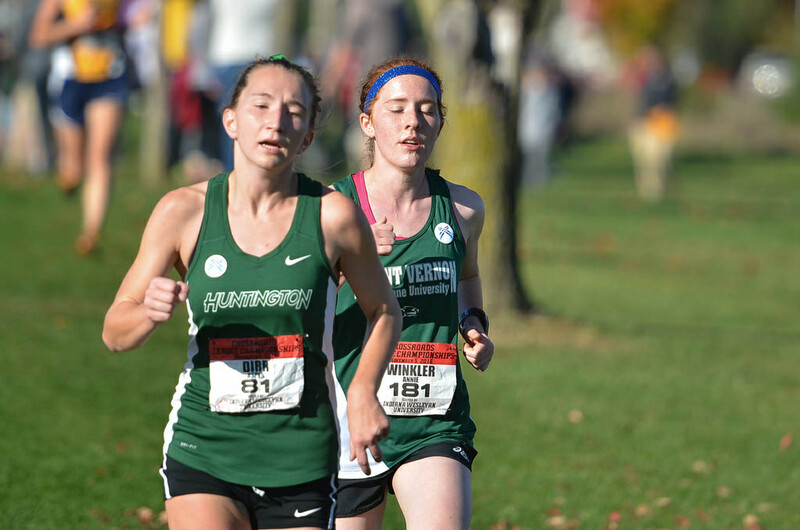 Dirr clocked in at 18:26.9, which earned her third place in the league and secured her a spot at NAIA Nationals, while senior Christine Sparks finished at 18:56.9 and placed ninth in the league. They were followed by Marie Ditzler (49th, 20:24.9), Amanda Fielding (57th, 21:09.5), Kelsey Graber (59th, 21:15.5) and Cassidy Johnson (62nd,21:37.9), respectively. The women placed seventh in the league overall. “Many of the runners ran personal bests at conference, which was my goal for all my runners,” said coach Fred Miller. The team graduates two seniors this year, and Sparks says she is grateful for everything running has taught her. At Nationals at North Farm Cross Country Course in Elsah, Ill., Dirr finished 103rd of 335 runners with a time of 18:48.49, which is two minutes faster and 200 places higher than her race at Nationals last year. Coach Miller said he is confident Dirr will continue to improve. On the men’s team, junior Zach McIntyre crossed the line first for the Foresters with a time of 27:38.0 to earn a 49th place finish. He was followed by junior Codi Wiersema (56th, 28:14.3), Austin Wiley (59th, 28:49.5), CJ Robertson (61st, 28:53.1), and Michael Bowman (63rd, 29:30.4). Overall, the men placed ninth. Wiersema said the men struggled to run their best times at the same meets and looks for the team to improve in the next year. The men’s team will graduate one senior, Michael Bowman.